With my trip nearing its end, it was time to head south. I left Narvaez bay with beautiful wind and spent the afternoon tacking and jybing my way to Friday Harbor on San Juan Island (#7 on the map). I arrived just before the US Customs office closed (8pm). After clearing customs, I ate aboard and slept early. The next morning the harbor was shrouded in fog so I spent the morning tidying the boat, disposing of the plastic I picked up in Narvaez Bay, and prepping for the trip across the Strait of Juan de Fuca. 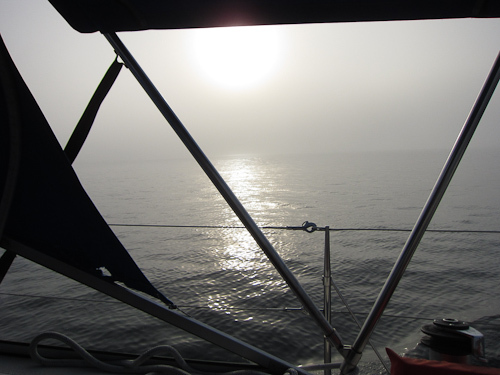 Like the trip north, the crossing south across the strait was a bit foggy but uneventful. Halfway across lies Smith Island with a lovely, lonely house where the lighthouse keeper used to live. With the lighthouse now automated, as far as I know the house is now abandoned. The island is now a wildlife refuge and off limits so I can't go ashore to explore as much as I would like to. 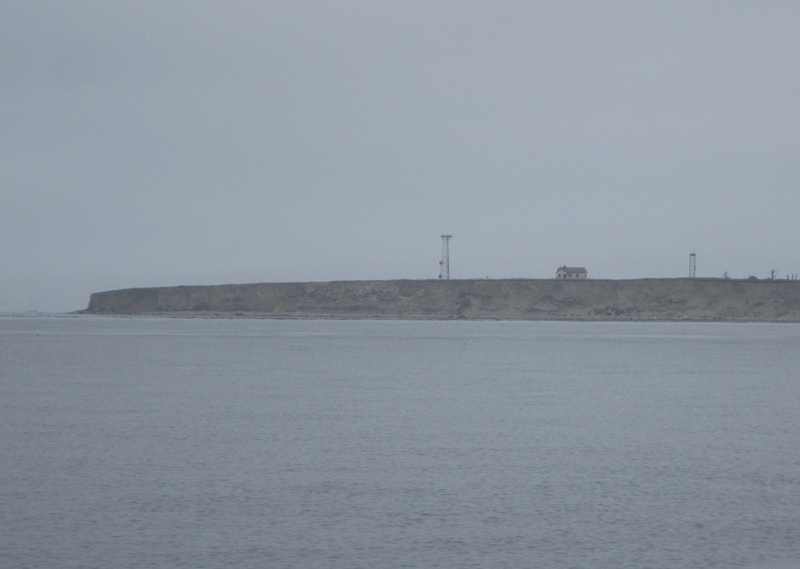 Instead, I just look at the house through binoculars every time I pass and wonder of the lives of the people who once lived on this lonely island. 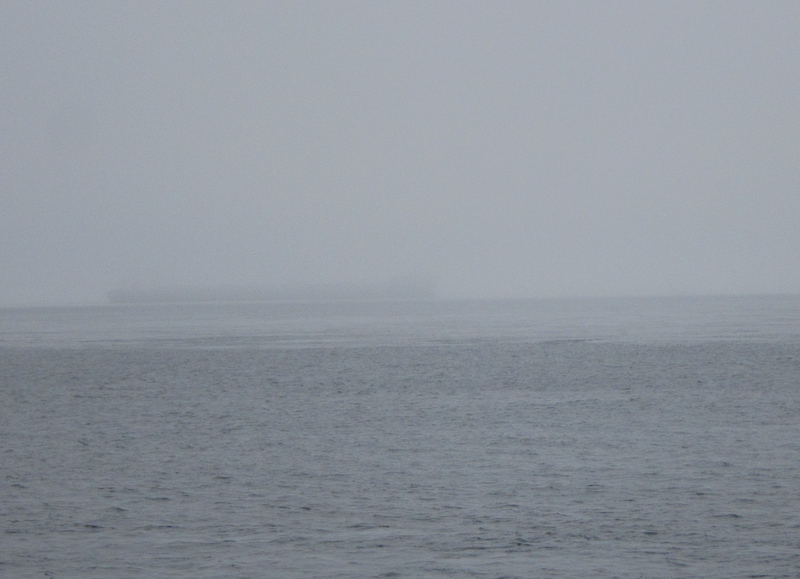 I hit fog inside the Admiralty Inlet and turned on my radar. 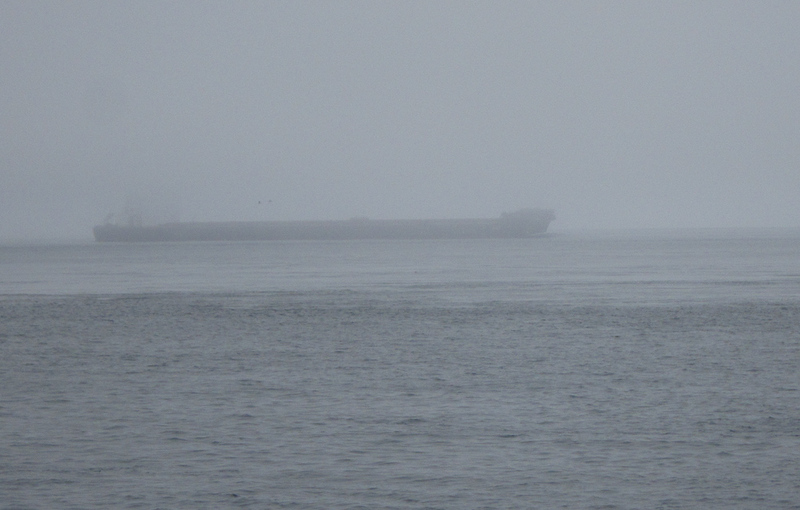 It was slow going against the tide and I kept well out of the shipping lanes. 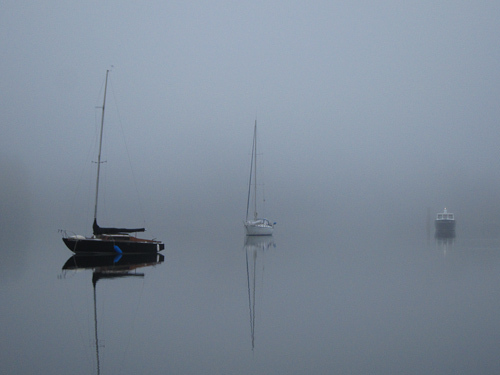 In the fog, you hear boats before you see them. Then you see a shape slowly form in the mist until it turns into something recognizable. Without radar this is a very nerve wracking experience. 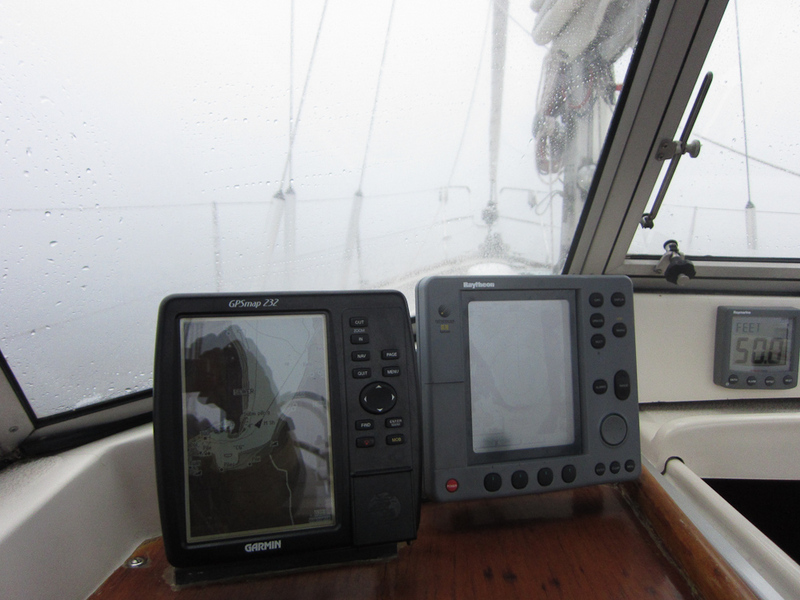 Even with radar it can be a bit scary as you must keep your eyes on the radar, map, depth sounder and on the water in front of the boat looking for crab traps, logs, or small boats that do not show up on radar. 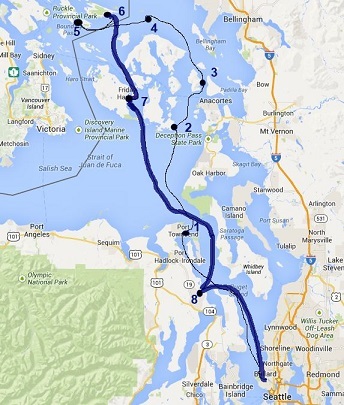 I had hoped to get as far as Kingston but with the sun going down, I made for port Ludlow (# 8 on the map). It had been a long day and I arrived just at dusk. Anchoring in the dark was a bit strange but the anchorage was protected and I had plenty of room to swing so I dropped the hook, made a quick dinner, and went to bed. The next morning I woke to fog again. With my experience the previous day, I was undaunted and headed out even though I couldn’t see much past the end of the boat. Again, my instruments were my friends and I kept my eyes on them for the next few hours until I broke out of the fog near Point No Point where I turned south toward Seattle. Coming into Shilshole Bay and the entrance to the locks after my week away, I felt proud. I had successfully handled the boat including anchoring, docking, and setting the sails (spinnaker included) solo. 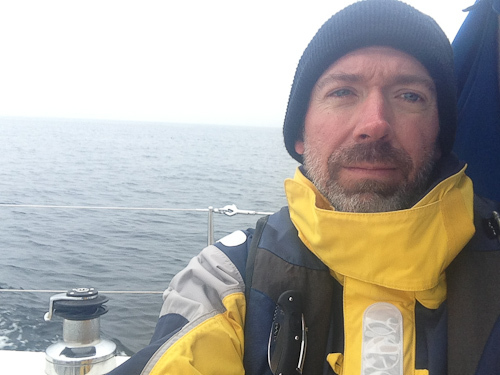 It was unique to be on the boat so long by myself – usually I have family and friends aboard. While I enjoy company there was a certain satisfaction with sailing alone. Although I am not sure I would want to cross an ocean solo, I understand the lure. 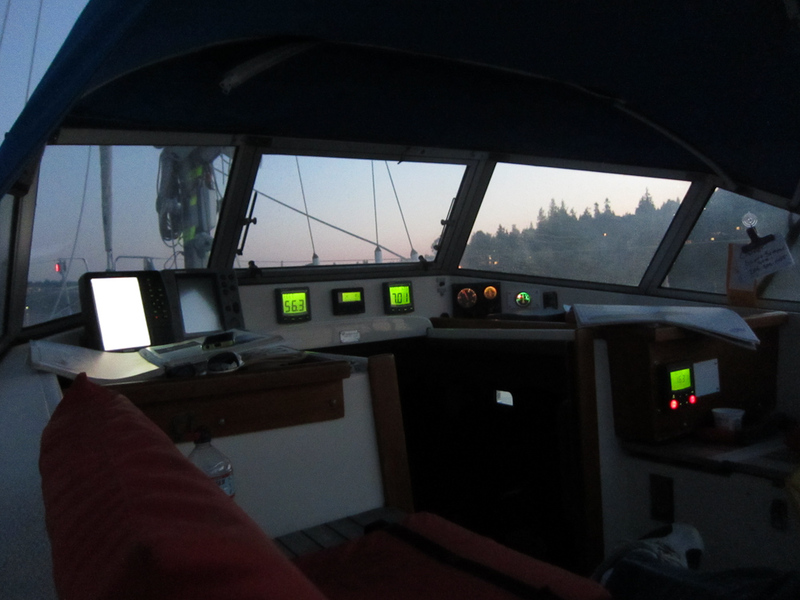 I returned to Seattle confident in my skills and re-energized by the experience, and pondering what type of sailing I want to do in the future.